The Bub just had his first birthday, and according to the updates on my phone, this makes him a toddler. I am not sure what counts as toddling, but he is on the move. This might be a helpful list for anyone giving to someone celebrating their second Christmas. He or she are too old for the infant gifts, but not quite old enough to straight up tell you what they want yet. Even if he can't say it out loud, our Bub makes it clear that he wants two things: garbage and food (and sometimes he counts those as one). We can suggest garbage over and over as a gift (really, just decorate your biggest box and he'll be a happy boy), but I know I would want to buy a more substantial gift, so this is a list to inspire you. You can find tons of neat stuff for toddlers that are still green: eco-friendly, recycled/ used, or Made in America! Books- You can never go wrong with books. Most board books are made in China, so I would start looking at consignment shops for those (not to mention book sales, where you can find great stuff! ), but many regular children's books are manufactured in the US! And you can never have too many. And if you get doubles, you can always donate them. This is one on my list for The Bub. Yay books! Cooking Toys- The Bub loves his pots and pans, and he loves being in the kitchen while his dad cooks. I think by 2 (so somewhere in your little toddler's year), he would love to fiddle in a play kitchen or with his own pots and pans (not the ones he steals from the kitchen and hides in his box). First of all (and no one take this personally because we have kept and loved your gifts), can I just say I kind of hate Melissa and Doug toys? Those jerks are shisters, and one of their items comes up in any "Made in America" search. I don't know which person in marketing did that, but they deserve a raise. Their toys are so cute and nostalgic, they look handmade, perfect toy right? No! Those toys are all made in China, and I suspect based on their products that they lift legitimate American toymakers' designs and then schlep the work off to people being treated badly so they can sell it cheaper and run out Actual American /businesses. Boo! Even worse, their toys are damn cute, but you can find other cute stuff too! You don't need them! First, I see play kitchens pretty often in consignment stores, so buying one and giving it a good clean would make for a great gift- kids this size don't know the difference! If you can't find one used, you can also buy really beautiful ones on Etsy. Willow Toys makes my absolute favorites, they look traditional and a little bit modern at the same time. A Toymaker's Daughter also makes a wood play kitchen that looks cute and sturdy. Green Toys, who loyal readers know I love, sells adorable kitchen accessory sets like this one. If you want a new toy kitchen, try this one from Little Tikes, which starts low and can be moved around once the Bub grows! It's always good to stretch out the life of these toys. Plus, I love the hood! How cute. 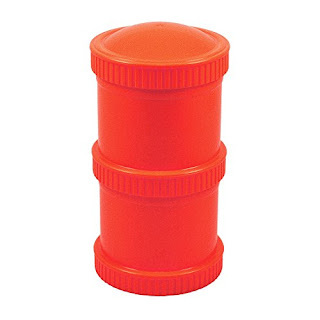 You can also find all sorts of kitchen toys. Vintage ones like this set from Vintage Prarie Home, as well as handmade ones. This toaster from Forever Afters is my favorite thing that has ever existed. If you don't want to munch on that wood toast, you are crazy. You can avoid that infuriating Melissa and Doug (liarpants!) by buying your play food Made in America from stores like Little Green Market, Hopewell Creek, and Greer TW, all of which make soft felt food of all sorts of varieties that are lipsmacking adorable. Bring Your Own Imagination makes wood play food that would be great for an older toddler. Simple Clothes- For whatever reason, we are often short on pants over tops (and now with crawling, the pants are having tougher runs), so this could make a great gift, especially if they are pretty simple and would go with lots of things. I think used clothes are a perfectly awesome gift for little kids, so if you can find used jeans or pants at a consignment store, that still counts as a find! I like these soft pants from City Threads or these sweats from American Apparel- both are made in America and still affordable! Pact also makes soft cuffed pants perfect for basics, and we don't have any, but based on my other experience with this company, I feel confident they are soft and cozy! Socks- Oy, we finally sorted out our socks and are donating all the socks for 0-9 months (so like 80% of them). It is also getting cold, so going out barefoot counts as bad parenting (and gets you dirty looks from other mommies- mind your beeswax people, he threw them). Socks are also a tough one to get used by the 12-18/18-24 phase, because I doubt many pairs make it the whole way through together. Hanes makes large sets of baby socks that are simple, affordable, and made in America! We recently bought organic, fair trade socks from Pact, and they may sound like nonsense, but they are the best baby socks we have found. They actually stay on! Stuff for Eating- After the one year mark, a lot of our old feeding tricks aren't working anymore, and we are suddenly on the lookout for bowls, sippy cups, and tiny people silverware. I like these very simple cups from Re-Play; often the least fussy option proves to be the best. I also love Green Eats silverware and snack bowls. Most importantly, we use our reusable snack storage a TON (hello Cheerio's), and there are great options for that too from Re-Play Snack Stacks (in all sorts of colors, Made in the USA, recycled plastic, win) or glass options like the Wean Green snack cubes. Re-usable pouches are one of my most comforting finds from doing all this research. No judgement if you use them, because you have to go with what works at times, but those one time use food pouches are like water bottles or plastic straws- jacked up price, used once, and on to a landfill. To put it in perspective, the pile of pouches you throw away now will still be in a landfill or the water when your baby is walking with a cane and chasing darn kids off their lawn. The plastic waste we make "for them" will be what they inherit from us. We can do better! You can take food or smoothies you make yourself (or even buy in larger servings), and put them in a reusable pouch, basically cutting those eco-monsters out of your life. 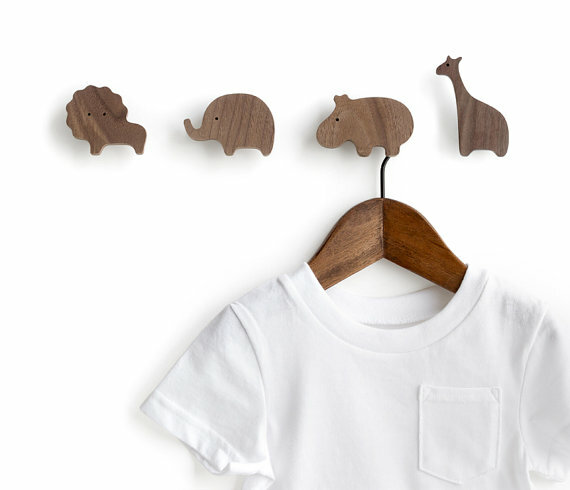 Awesome gift for anyone with an early eater. 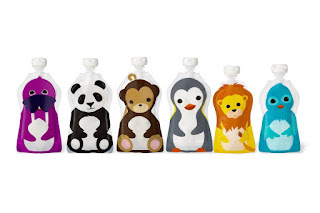 Sqooshi Designs makes pouches with animals on them, that your child might like even more! 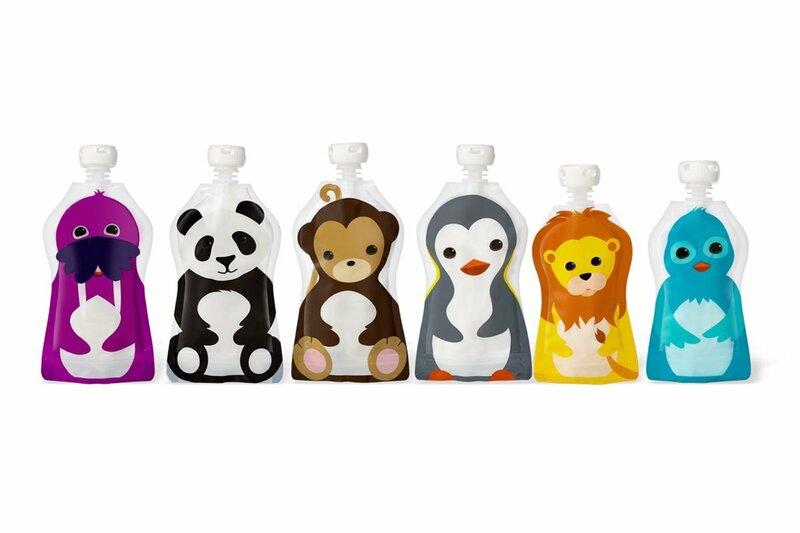 Nature's Little Squeeze and Little Green Pouch are also affordable options that can be recycled! So, nothing in a landfill. That's a pretty awesome gift to give (for less than 20 bucks). Toys on Wheels (or with Hammers)- Ugh, boy stuff. Tiny masculinity seems to be rearing its head in our house. Someone has discovered the joy of pushing things around. I generally can't bear the thought of our house being taken over by cars (especially brand new Hot Wheels- at least get used ones), but I do have a soft spot for Little Tikes cars. We have one at my Nana's that has lasted forever, Little Tikes keeps most (but not all) of their manufacturing in the States, they spell "little" correctly, and the baby looks like a Flinstone. A lot of pros. 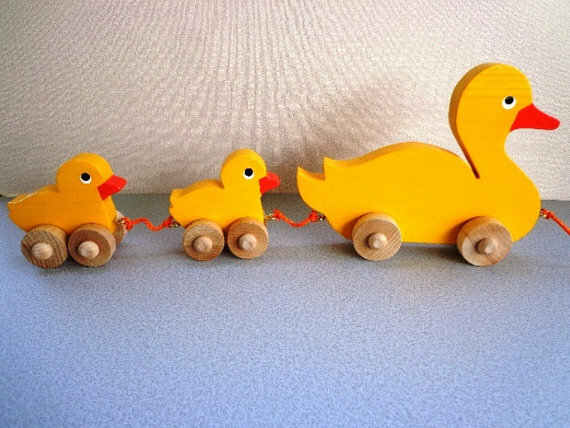 I also love pull toys like this line of ducks from Ozark Rustic Wood- super sweet design and it feels a little nostalgic in a good way. You could also do a train like this one from Green Toys (and they have one in more "girly" colors too, if you want to encourage your girly girl to diversify). The Bub got their Elephant roller for his birthday, and he loves it so far. He also loves to bang on things. To truly understand something, you better whack at it for a while. We have noticed he really likes his friends toys that come with little hammers, but he doesn't have anything like that. This Holgate work bench, made in America, might do the trick perfectly. I also found a couple of used ones on Etsy (and we have had great luck finding wood toys in a similar vein at Goodwill. If you want the fanciest thing ever built purely to be toddler abused, these workbenches from a Summer Afternoon are beautiful. Ok, these are just a few other ideas I think could be great for someone in this age range, if not necessarily for The Bub.It's really harder to do this for tiny people, especially when catalogs and cardboard boxes are all they want anyway. Blocks- Mondo Bloxx are super affordable and Made in the USA. Win. 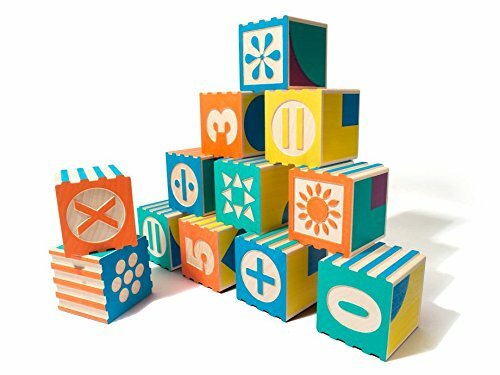 Uncle Goose are our house's favorite blocks so far, come in all kinds of cool themes (Japanese characters, Nursery rhymes, you name it). Another win! I have solved your pressing block problems, right? 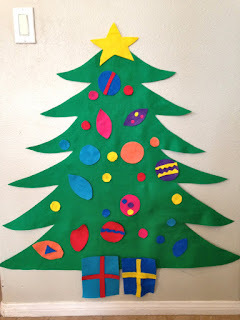 Felt Christmas Tree- For the curious and handsy, these felt Christmas Trees make something for them to play with. 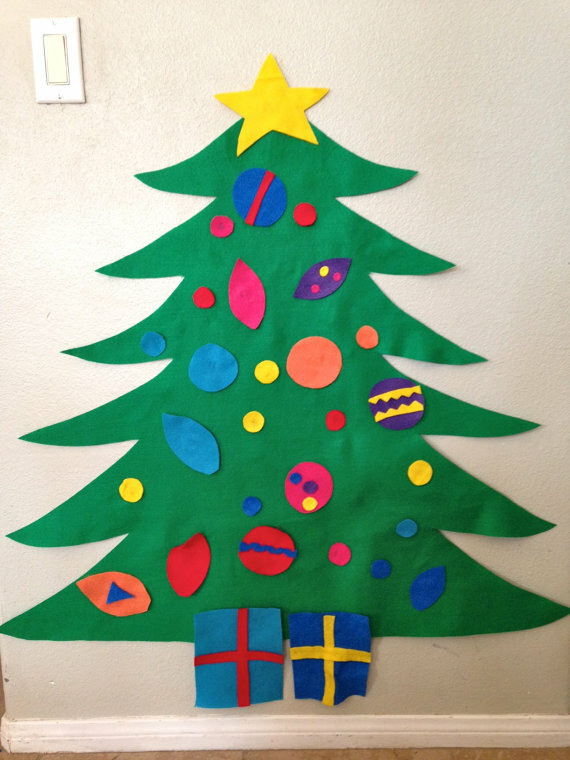 You could probably even make it yourself for a fun homemade gift, but if that seems daunting, Woulfs Creations makes a super cute felt tree that I know I would be picking up from all the time. Cake in the Morn also sells an adorable version. 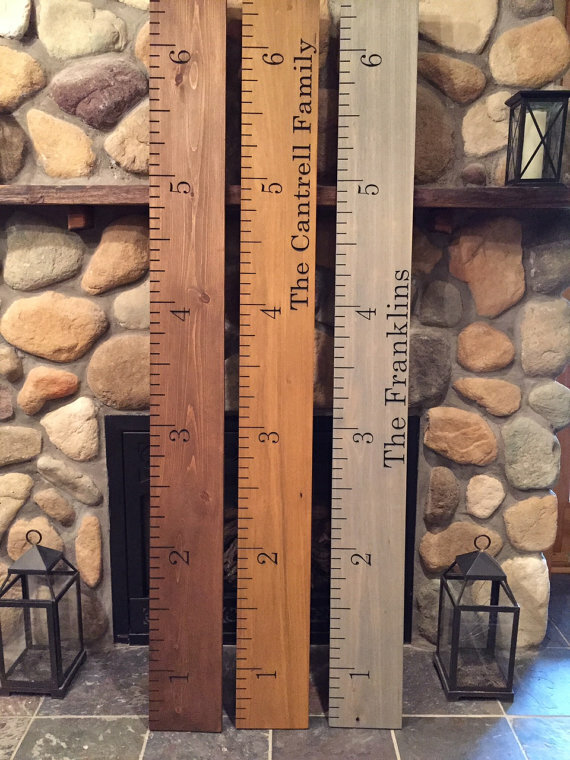 Growth Charts- Just as baby starts to really walk and stand, this is a perfect time to start that growth chart. And if you are shopping for a family like ours, they may want one they can bring with them, because they may not use that doorway forever. I love these. I love them so much I can't buy one for my son because I would know it was really just for me. I love the idea of having all of our kids' growth marked on something like this. I especially think this one from Domestic Blueprint is so pretty and well done. By not making it as childish, you could really put it anywhere in your house. Grace Words by Melanie makes one that has a more distressed vintage look that I would want for my house. I like the rustic feel of these charts from Alba Organics. Paola Brown Shop makes a chalkboard one if that is more your style. Mixt Studio makes a growing tree themed one if you are looking for something for your bub's room. Hats- Not sure what to buy that tiny person? Buy them a cute hat. When parents say "it goes so fast," they are really bemoaning that the time for cute hats has passed. So help them enjoy these days now, and add to the hat supply. You can start by looking at consignment shops, which always have a good collection of warm hats. But really, for cutesy hats, Etsy is where it's at. We got this yoda hat from Unforgettable Stitches for 10 dollars, and it has spiced up many a cold day. Think of a theme that the parents would love and write "spaceship baby hat" or "pizza baby hat" or "angry magician baby hat" into Etsy and see what you find. You might be surprised, and it's a slam dunk as gifts go. Her/His Own Seat- I can remember around this age, my niece loved to lounge and sleep on her brother's low car chair, which folded out to a long cushion. I feel like part of the box appeal for my son now, is that it is essentially his own space. I like the idea of continuing that by getting a seat just for the toddler, even if you know they won't stay there long. 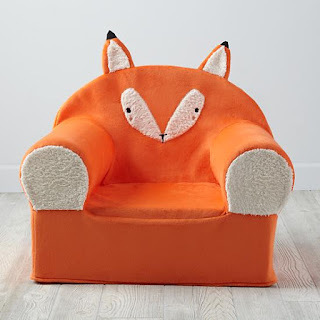 Land of Nod sells an adorable miniature armchair for kids this size, and the chair is made in the US (the covers aren't). A Whitfield Design sells adorable whale rocking chairs that might work for the future Ishmael on your hands. Travel Help- I like these carriers that turn a car seat into a stroller for airports. Not as nice as just not bringing a car seat, but it might be the perfect option for someone. Not perfect, but better than buying another massive travel carseat. We made it through another one! I hope this helps you find some green inspiration for shopping for the little one in your life- it can be done! If you want more shopping inspiration, check out my List of Shopping Lists!